Maulana Azad National Scholarship for Girls belonging to Minorities is provided by Maulana Azad Education Foundation (MAEF), Those girl students, who have got 55% in class 10th examination and got admission in class 11 th in the year when result of 10th exam is declared, are eligible to apply for this scholarship scheme.Maulana Azad Education Foundation ( MAEF ) was established on the occasion of Maulana Abul Kalam Azad's birth centenary celebrations. The Foundation is a voluntary, non-political, non-profit making social service organization, established to promote education amongst educationally backward sections of the Society. It is fully funded by the Ministry of Minority Affairs, Govt. of India. The Honorable Minister of Minority Affairs is Ex-Officio President of the Foundation. It was registered under the Societies Registration Act, 1860 on 6th July 1989. 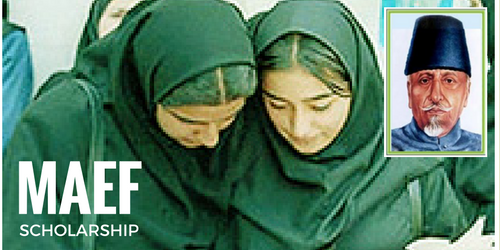 MAEF has provides Maulana Azad National Scholarship of Rs.12000/ each (Rs.6000 in XI and Rs.6000 in XII) to meritorious girl students from minority communities. Only Girl Students belonging to National Minorities,(i.e. Muslims, Christians, Sikhs, Jains, Buddhists, Parsis) can apply. Should have secured not less than 55% marks (in aggregate) in the secondary school certificate examination (Class xth) conducted by any recognized Centre/State Board of Secondary Education. The List of 33 recognized Boards/Councils is given in Annexure-III. This is only qualifying percentage for applying and does not guarantee grant of scholarship which is given to the top eligible applicant based on the quota fixed for the concerned state from amongst the eligible application received from the state. Family income of the student from all sources should be less than Rs. 1,00,000/-(Rupees one lakh only) in the preceding financial year. In case of salaried class, the student must indicate the designation, pay-scale, basic pay and other allowances alongwith total gross & take home emoluments of the parent/guardian.A mere statement saying “Service” will not be acceptable. The student must attach a Salary Certificate or Pension Certificate (in case of retired persons), duly authenticated by controlling authority, of her parent/guardian alongwith the application.In case of agriculture/horticulture etc., the students has to mention total land holding with details of irrigated and non-irrigated and other landed property owned by her family alongwith total income of the family. These details will also be mentioned in the affidavit of the parent/guardian (Annexure-II) as well as in the certificate from Revenue authority.In case of business class, the student must categorically state the name & type of the business alongwith the total turn over and the total income of family. The same details will also be stated in the Affidavit (Annexure-II) from her parent/ guardian. Income form all other sources must also be mentioned, specially if mother is also employed. It must be noted that all income certificate and statements made by the students in the application is subject to further verification of Maulana Azad Education Foundation.In case of any deliberate discrepancy/concealment of facts, the MAEF may cancel/recover the scholarship granted/released as well as initiate necessary action as per law. The income certificate/affidavit (Annexure-II) must be from the parents/guardian’s side and should have been issued from the respective home station. The income certificate issued or affidavit made from the place where the student is studying, as against the home station, will NOT be acceptable (in case of photocopy, it should be attested by Gazetted Officer or Head of Institution). Should have Confirmed admission in class-XI. Admission Slip issued by the college/ school where the student is presently studying and verification of the principal (Annexure-I), in the prescribed proforma must be sent with the application. The University/College/ Institute offer ing admission should be recognized by the Government at the Central or State level or any other competent authority. How to apply Maulana Azad National Scholarship ? Interested and Eligible Candidate should be submit their application through MAEF official Website http://www.maef.nic.in/ through online . All documents will be required in Hindi/English version.Which have to be sent by post along with printed Application form. It is absolutely necessary to give contact telephone number of the student; present School/College Telephone no. must also be given. List of documents to be attached with online application. Complete address like House No., street No., Block, District, State and Pin No must be mentioned. Phone No. /mobile No. of parents/Guardian should also be mentioned in concerned column. A copy of bank passbook/Aadhaar card should also be enclosed to make it convenient to collect any informal easily.